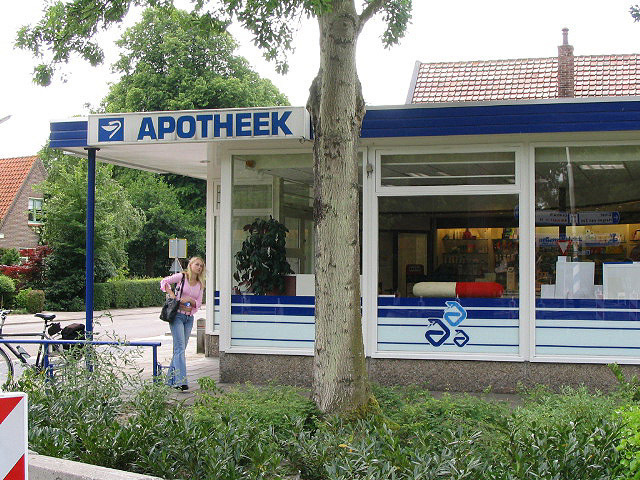 The “woollen sound pil” was first presented in the chemist in Schoorl in 2004, during the Schok Art festival and after that went on tour in Alkmaar in the north of Holland to visit more chemist shops. There were different reactions of the visitors and people working in the shop depending on the district of the town and location of the chemists. 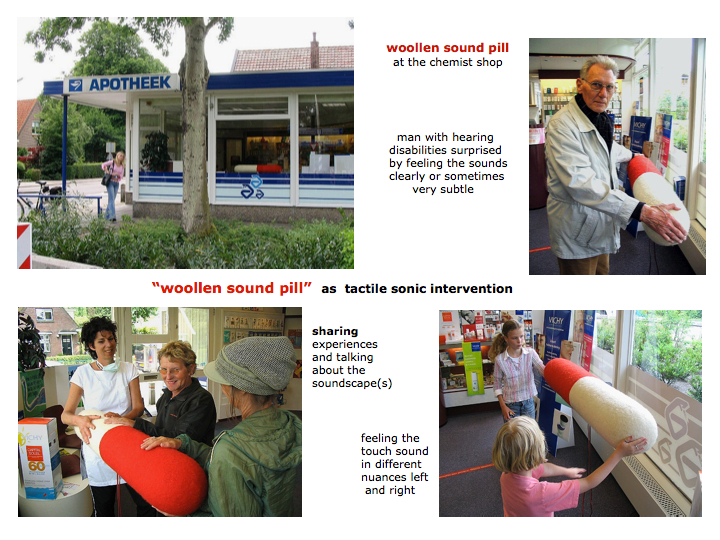 The “woollen sound pill” was not meant to “manipulate” or influence the public on a unconscious level like Muzak or background music used in a lot of shops and other public spaces nowaday’s. The “woollen sound pill” is clearly present and accessible in the space, inviting the public to experience the woollen touch-sound in a playful manner, so challenging their understanding of such spaces. Maybe they like it or maybe not, maybe it calms them, perhaps activates them, inspires or irritates them, it provokes the sharing of these experiences. The essay: “woollen sound pill as tactile sonic intervention” was published in the book Hearing Places, Sound, Place, Time and Culture, Editors: sound artist Ros Bandt, Michelle Duffy and Dolly MacKinnon, University of Melbourne, Cambridge Scholars Press, date 2007, chapter 30. The ‘woollen sound pill’ is a woollen sound sculpture in the shape of a capsule (as in that of a capsule for medicine) but it can also seen as an abstract shape depending on the context of the place of presentation. The ‘woollen sound pill’ produces soundscapes with sounds of gongs, birds, sheep, frogs, water, machines, and crackles. Some parts of the soundscape-composition are recognizable as concrete sounds corresponding with ‘known places’, other parts have a more abstract quality with several sound layers evoking imaginary spaces. Because of changes in loudness, sudden clearness, contrasting frequencies, and changing contents, the woollen soundscapes are creating a new (sound) space within the space, more or less intertwined with the existing surrounding sounds sensed by the public who are auditory performers as well. The sounds of the ‘woollen sound pill’ are hear-able reflected in the space but also touchable; the resonances and vibrations through the woollen material can be felt in different nuances: ‘touchsound’. By presenting the ‘woollen sound pill’ there is always the combination of its perceptual being in the space: the physical, touchable, woollen soundsculpture in the here and now and the imaginative soundscapes that allows the public to associate/dissociate, to ‘travel’ in time, in memory and in imagination.